Over the past several years the stemless glasses been very much in the limelight. You will find this sturdy glass appearing in many wine experts and enthusiasts’ homes and top restaurants and it has certainly taken the glassware industry by storm. Of course the on-going debate between the stemless vs. stemmed wine glass continues to this day. Despite the recent surge and demand for these glasses, they have been around for a long time especially in Europe. They have been used for centuries and were previously known as either a ‘drinking vessel’ or ‘wine tumbler’. Countries such as Spain, Italy and France have used stemless glasses for years as a convenient way to serve wine as well as a variety of other drinks including soft drinks, cocktails and water. Over time (and thanks to expert glass-makers) the wine glass and tumbler has adapted; known as the wine glass evolution. However many wine experts feel the stemless glass is a ‘step back’, to a time when we did not know that the shape and size of a glass can contribute to the tasting and enjoyment of wine. On the other hand, some experts see the positive transformation of an ‘all-round tumbler’ to a widely used and loved wine accessory. In the 21st century stemless wine glasses are seen as a trendy addition to a glassware collection. Many contemporary bars and restaurants use stemless glasses as they are easy to store and are suitable for the dishwasher. This is ideal when serving a large number of wine thirsty customers. These glasses definitely attract a lot of attention and can be extremely useful if you are hosting a party or big occasion. It also brings a new dimension to the tasting experience; different to that of a stemmed glass (or so it is argued). They are available in a range of patterns and materials to suit your own personal style or an occasion. You can personalise your stemless wine glass for yourself or giving as a gift. Interested in buying stemless wine glasses? 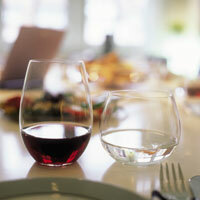 Browse a selection of stemless glasses from Riedel and Schott Zwiesel. If you would like any more information on buying stemless glasses then please feel free to contact us on 01903 786148.